Satoshi Nakamoto, no matter how hackneyed this name is in the cryptoverse, the person/group is synonymous with the concept of cryptocurrency and Bitcoin. Last year marked the beginning of the inner workings of Blockchain Technology, expanding blockchain verticals to greater heights. As we step into 2019 Blockchain doesn’t seem to be showing any signs, instead the technology is going places, quite literally. The usage of Blockchain in different industries has been the significant factor that has led to the differentiation. Private: Controlled by a few people, has trusted members. When Bitcoin worked as the only blockchain, there wasn’t a considerable difference between both the terms and they were widely used, interchangeably. As technology grew, blockchain evolved making immutability its core strength. Technology enthusiasts explored a range of operations right from decentralized registry to peer-to-peer name delivery of messages without an interception. These aspects weren’t possible through cryptocurrencies, as they gained the shape of assets rather than a platform like Blockchain. This forms the most significant difference between the two. Smart contracts can help solve the financial hiccups brought by Middlemen. Buying a house with almost zero paperwork will commence soon. “Digital Inheritance” may become a problem, as modern problems require modern solution, Blockchain’s immutability factor can solve this with ease. A middle-man free world is what blockchain promises, due to its complete decentralization. Student transcript forgery is on the rise, the one way for job providers to be sure is to check the authenticity of the students’ transcripts through Blockchain. Again, smart contract will help in this sector, there won’t be any fraudulent means to mistreat the money that’s donated. Cryptocurrency is essentially a virtual currency formed through cryptography, “the art of solving or writing codes.” Although, in various values attached to these coins or tokens they serve different purposes on these networks. As opposed to blockchain, cryptocurrency uses tokens based on the distributed ledger function. Cryptocurrency is not an upgrade of Blockchain, as is perceived by many. It is more like a tool or a solid resource in the blockchain. Cryptocurrency identities itself with the trade factor, and has transformed itself as the next means of taking forward crypto-trade and exchange. Blockchain’s financial clout is limited to the gas price through cryptographic models. Meanwhile, Cryptocurrency has transformed itself as the primary monetary system being used in Blockchain. 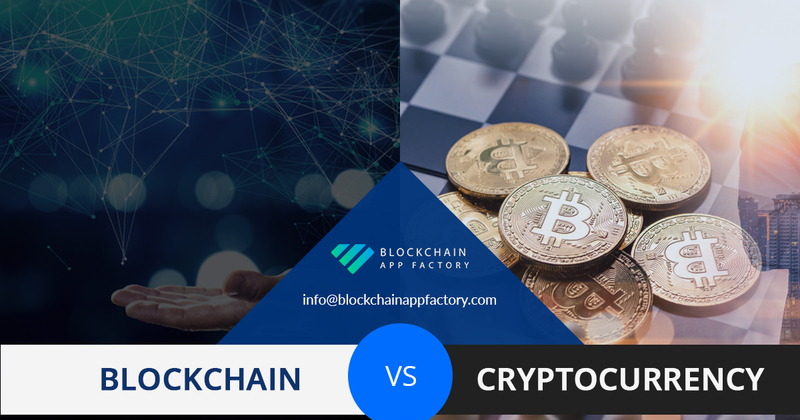 The drastic increase in both these entities has resulted in the demand of many Cryptocurrency Development Services, whereas the clear winner is the Blockchain technology, because of its many benefits, Blockchain development has now become a widely sought after service among crypto enthusiasts.